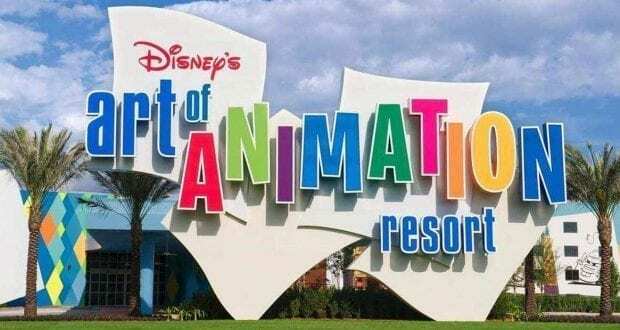 Disney’s Art of Animation is the most recent addition to the value resorts at Disney World. The Lion King, Finding Nemo and Cars areas are dedicated to larger groups and are made up of family suites, whereas The Little Mermaid area has standard size rooms. This resort has a lot of offer Disney fans and is definitely a fun place to call your home away from home during your vacation. Here are 10 reasons to love The Art of Animation Resort. Many of the resorts at Disney have touches of Disney in their theming, but they aren’t always focused entirely on Disney films or characters. 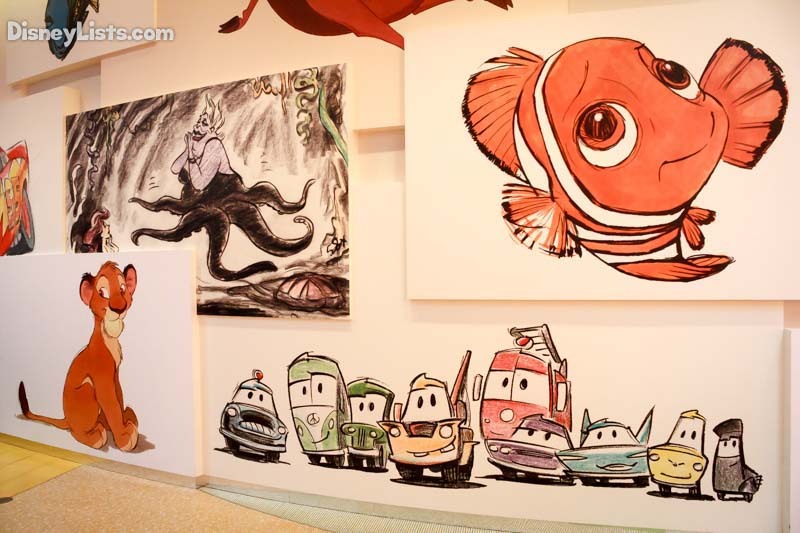 The Art of Animation resort is completely dedicated to all things Disney. If you want to be surrounded by everything Disney throughout your entire visit, this is the resort to book! 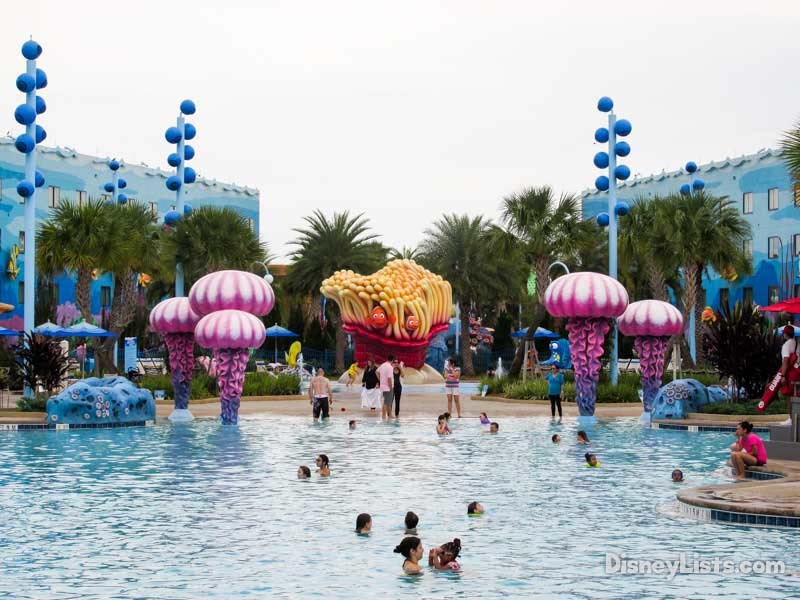 The Big Blue Pool is the largest resort pool at Disney World. It is inspired by Finding Nemo, and you’ll see big, pink jellyfish at the edge of the pool, and you can even hear music underwater! Although the Art of Animation is in the value tier, it does fall into the higher price range of the value resorts, but that doesn’t mean it’s not good value. The suites can cost quite a bit more than a standard room in a value resort, so it’s best to look at Art of Animation as being in its own category, as opposed to comparing it to the other Value resorts. The theming is much better than that at the other value resorts, and if you are traveling with a large group, these rooms are a great option, especially if being surrounded by Disney at all times is important to you. The rooms at this resort are less expensive than many of the rooms at other resorts that could accommodate as many people. Art of Animation still get great amenities, and all the bonuses of staying on Disney property, such as the transportation and Extra Magic Hours. The splash pad area at Art of Animation is called the Schoolyard Sprayground and it’s perfect for little ones who need to cool off. There are water jets, and Finding Nemo characters surrounding the splash area. Art of Animation has a good amount of recreational activities if you want to spend some time at the resort. There’s a playground, arcade, surrey bike rentals, there’s fishing, and movies under the stars. If you like to stay active during your vacations, there is a jogging trail around the resort. The Big Blue Pool has size and Finding Nemo, but the Cozy Cone Pool has Cars theming and a more laid back and quiet atmosphere. There are cone shaped cabanas to lounge in around the pool, and there are models of the cars/characters from the film that really elevate the theming here. One thing we really do love about the Art of Animation is that it does not share shuttle service with any other resort. If you are familiar with the All-Star Value Resorts, you know that one bus will make stops at all three resorts, which can make your bus trip longer if you happen to be staying at the last resort on the route. Art of Animation has its own bus, which may not sound like a big deal, but it is, especially at the end of a long day at the parks. The Landscape of Flavors is the dining area at the Art of Animation, and the theming of the resort continues in this area. This quick-service location is open for breakfast, lunch and dinner, and has four different seating areas. The menu mostly features American fare, but is sure to have something for even the most selective eaters. The theming in the lobby and main building stays true to the name of the resort. It features animation artwork from Disney films in various stages of the animation process. The rest of the areas are focused on specific films. The resort buildings each are dedicated to a Disney or Pixar movie. The theming outside features larger than life character icons, which make for great photos! The theming also extends into the rooms. This resort offers some of the most Disney specific theming at the resorts. It’s fun, bright, colorful, whimsical, and kids will absolutely love it! The Family Suites are definitely one of the main reasons we love this resort. The theming is everywhere, from the carpets, to the curtains to the lamps and chairs. There are three areas that have the family suites, the Lion King themed area, Finding Nemo, and the Cars themed area. These suits can sleep up to six people, they’re spacious (about twice the size of a standard room at a value resort), with a separate bedroom, and a small kitchenette. These can come in handy if you want to save some money and bring snacks, or prepare a quick and easy breakfast in your room. These suites are fun and comfortable for families and bigger groups.